With the end of autumn approaching and announcing the upcoming cold winter, it is time for you to invest in a proper warm pair of gloves made out of fine leather. For this winter, Medallion recommends you to treat yourself with an outstanding pair made by Thomas Riemer. Thomas manufactures his hand-made gloves in Hungary. Born in a family of gloves-makers. The glove-maker lineage started with his father, who has been famous in the industry for founding RIKA, a brand specialised in offering both fashion and professional sport gloves. RIKA gloves were used by Austrian skiing athletes, Swiss and Liechtensteiner during the 1968 Winter Olympic Games in Austria. The brand soon become recognized for the high-quality of its products, as many professionals used their gloves from policemen and firemen to the prestigious Spanish Riding School in Vienna. After his father’s death in 2001, Thomas Riemer withdraw from the family business although he was the Sales Director for Europe. In 2007 Thomas received a call from the oldest gloves shop in Vienna who told him that he was on the brink of retiring and that Thomas was the only person he could think of who had the know-how to take over the business. Eventually, he decided to take the ownership of the Viennese store and two years later as he was not pleased enough with the French and Italian manufactured gloved decided to found his own brand Thomas Riemer, and found two craftsmen in Hungary who carried the traditional skills for gloves making to help him manufacturing the gloves. Thomas Riemer has demonstrated an extraordinary talent for selecting the finest fur and leather from tanneries in France, Switzerland, Germany and Finland. Thus, his gloves are manufactured using a wide range of leather from pigskin, goatskin, deerskin, hair sheep, to reindeer skin, all with a rich texture. Each pair of TR gloves are Hand-Sewn. Making a pair of gloves is indeed a long process, leather pieces first need to be soaked during a bath for 24 hours in order to soften the collagen, the hides are then hand-stretched and finally hand-cut using scissors placed on a pattern invented almost 2 centuries ago and then punched, finally the leather edges are dressed and stitched to make a glove. Thomas Riemer craftsmen still traditionally hand-sew the gloves, it is a meticulous and delicate process to ensure t, with such a level the daily production can only reach three pairs. 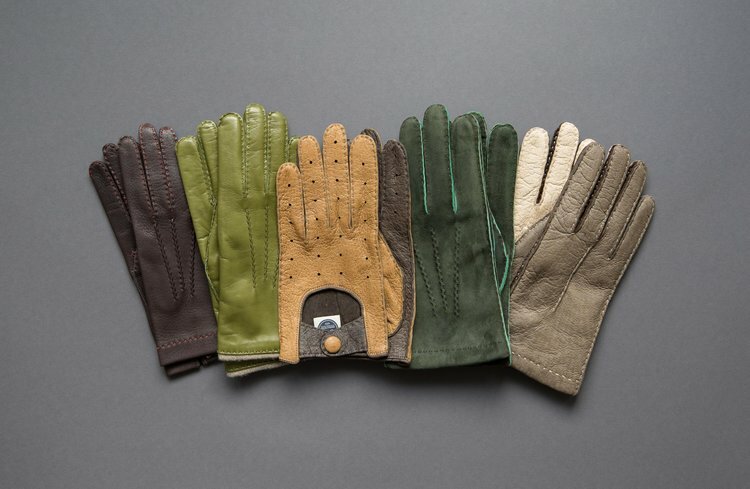 Medallion selection a range of different Thomas Riemer gloves made out of different leather, in various colours, stitching and lining. The first pairs we selected are made out of sheepskin, featuring a cashmere lining. Sheepskin feature a glossy shine as the leather is rich in oil, sheepskin turns out to be an ideal material for making small leather goods, gloves are no exception. Their smooth texture makes it the perfect choice for a gentlemen seeking dressed gloves. All sheep skin gloves are lined with cashmere of different colours. Light and comfortable, at the same time, this gloves will keep you warm during winter. Our second pair features goatskin, that is a very light and resilient leather, the collagen has a certain strength, a soft texture and unique handle. Goatskin has a silk like texture, that is a pleasure not only to wear but also to look. All of our goatskin gloves are lined with cashmere for added warmth and are thus the perfect companion for this winter. Colours available: Light Sand, Camouflage Green, deep coffee, Racing Green / grind brown. The third style we selected for our gloves is made out of wild boar skin, and lined with rabbit hair or cashmere.Wild boar skin is sourced directly from South America, the leather feels extremely soft, smooth and waxy. The wild boar skin is famous for being extremely tough, but can stretch and bend easily. The Thomas Riemer Wild Boar Skin gloves comes lined with rabbit hair or cashmere. 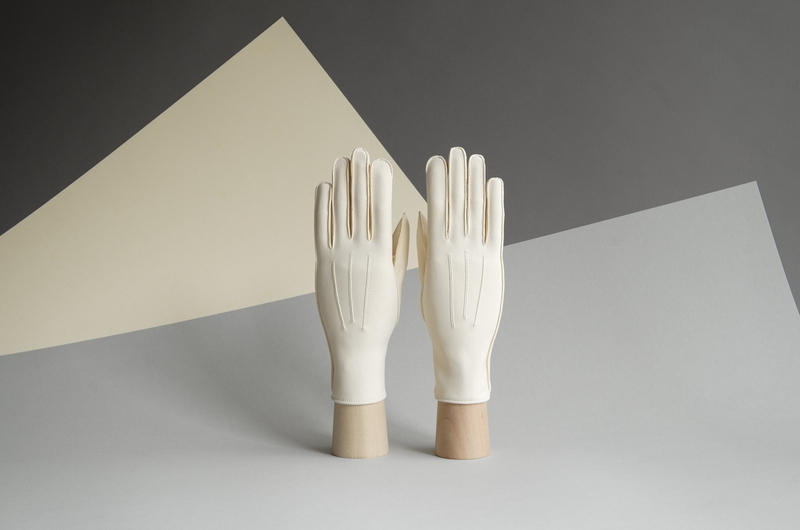 Our fourth style is a pair of deerskin gloves, that comes unlined. Thomas Riemer’s deerskin comes from Canada and New Zealand. The texture on the surface is the embodiment of loose fibres structure. Although gloves were traditionally made in Grenoble, France with Goatskin, Deerskin has been the preferred leather for sport such as hunting. As Deerskin proves to be a flexible, thick, and textured leather that will obtain a great patina over time, thus deerskin is also suitable for driving gloves. 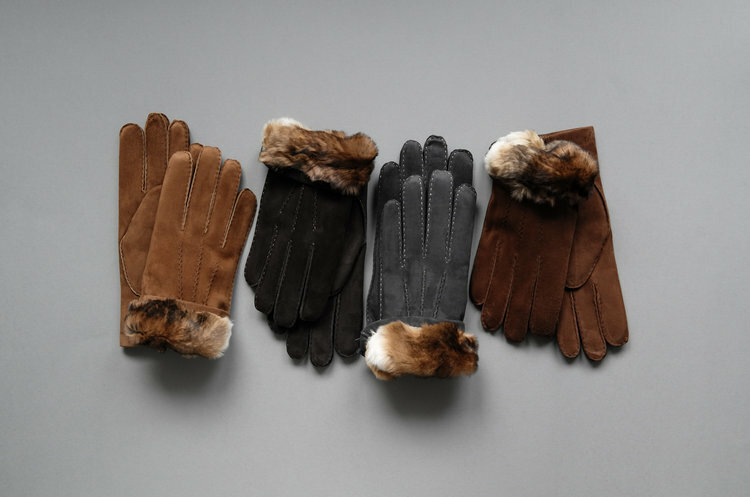 In addition, Medallion has not forget the ladies as we carry two pairs of gloves for women, a nut-coloured sheepskin gloves, and a dark brown deerskin with a flamboyant brown rabbit fur lining. A final advice to keep our readers’ hands warm for this winter, always put your gloves on when your hands are warm, before you going out, you will then keep warmth longer. A glove acts as a heat keeping not as a heat source.